Hi there, sorry it has been so long since my last post. I cannot believe how fast this month has gone. Usually January is such a long month for me, but this year is has just flown by. We have been pretty busy this month, so that is probably what helped....lol. Over that past couple of weeks I have been working on some Valentine's crafts for my husband and boys, but I have also made some other cards as well. 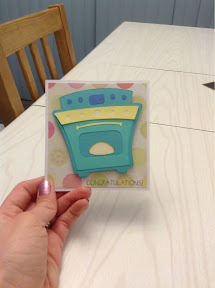 One of my good friends is expecting her second baby in August so I made this cute little card to send to her and her husband. The sentiment is from a My Pink Stamper stamp set and the paper is from a pack of paper I got at Costco. The second card I am sharing today is a card I made for my old doctor. We moved back in the summer, and were luck to have found a new doctor here in our new city. I wanted to send our old doctor a thank you note. She had been my doctor since I was 12 years old, and she had been a wonderful doctor for me and also for my husband and boys. This card is a standard A2 sized card. The roses and sentiment are from Papertrey Ink. 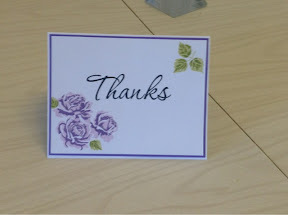 I wanted something clean and simple so I just stamped the flowers and sentiment and then mounted it on some co-ordinating purple paper.